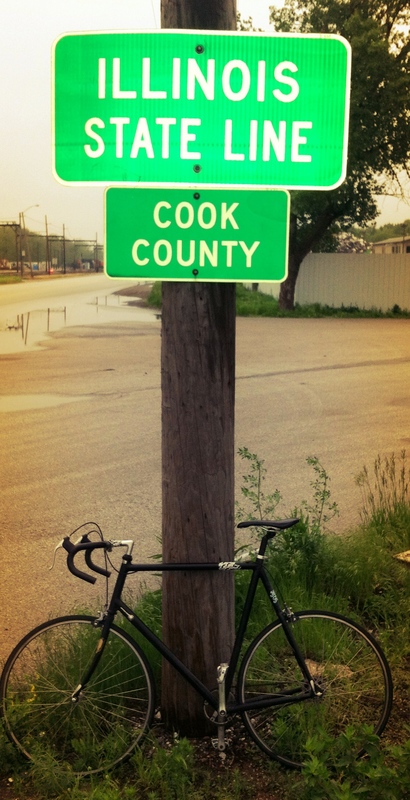 I rode Halstead in from Hessville, Indiana on a early Sunday Morning ride, unable to bring bicycles unto the SSL (South Shore Line) a rail system that connects the two states by running a route around the base of Lake Michigan, hence the southern shore reference. The ride itself was intense and as unusual as most of my solo adventures tend to be. Michigan Ave. was my starting point and I rode that for about eight miles. Weather in the Midwest is always a peach, and on this morning it was a scant 59 degrees, with a mild drizzle. I just rode it out as hard as usual. blocks to Downtown. StreetsI’d imagine in every metropolis are being serviced in intervals, and this was no different equaling pot holes, concrete cratered in at points. Cracks. Whatever! It’s not only the Midwest, it’s Chicago. By the time I get downtown, it’s plenty chilly and one of the five cans out of the six pack I started my voyage with that were remaining had popped. Leaving me soaked after that massive huff of fresh air that I had been taking in since I had gotten on the bike. Two Sunday’s ago I took a great neighborhood ride from Capitol Hill to the Lower Highlands. Scenic, lined with Aspen and Nineteenth Century architecture it’s a relatively easy ride. After visiting with a friend of mine I decided to come back riding a similar route which is Colfax Ave. past the heart of Downtown over the I-225. Well on my trip back I ended up on 31st and Tejon, and guess who I see but “Paul” a gent who rides a 1878 Penny Farthing and if you ask him, he’s nice enough to answer any questions that you have about this particular model of bicycle which was a staple of the times Denver blossomed as a city in the late 1800’s. The Penny Farthing was the first two wheeled self propelled machine actually referred to as a “bicycle.” Well, coming down this lazy “L” shaped hill I spotted Paul and a fellow rider zooming down the hill on their way for ice cream at a popular local shop. Well, as a freelance blogger for Velowood here in Denver, I got really excited when I saw these guys and I said hello, they set the bikes up for a picture and Paul and I talked for a short while. The excitement about biking in the city is apparent in the smile of the young guy behind the bikes in the photo I took. 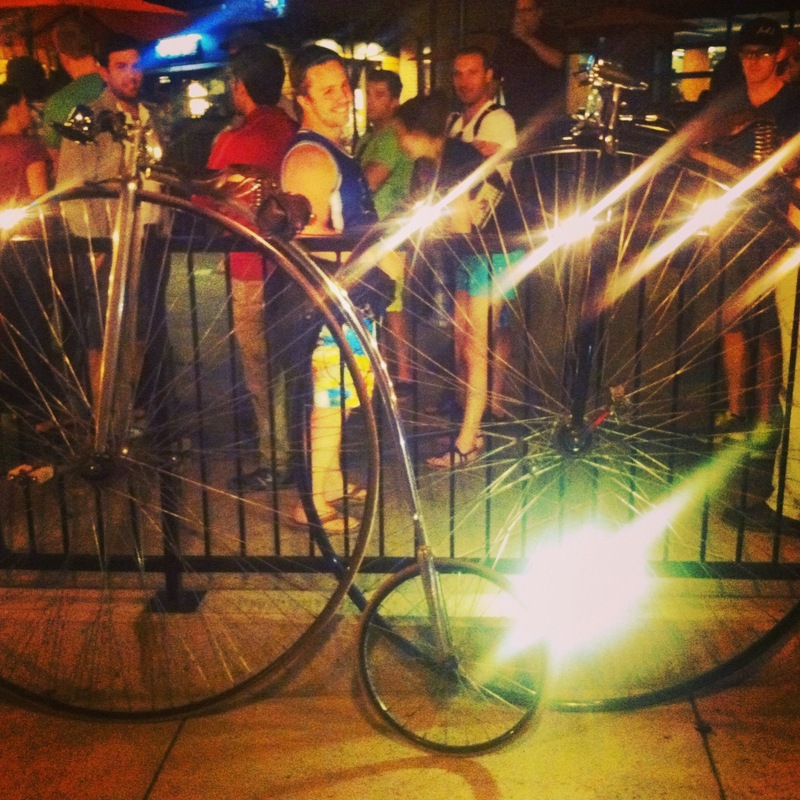 I had the exact grin on my face the first time I met Paul on the Penny Farthing.